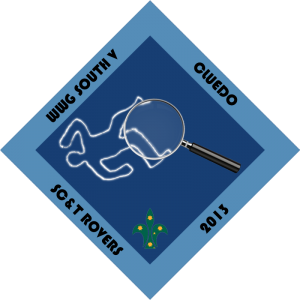 Cluedo, Weekend Wide Gamesâ€™ 5th South event saw the crime fighting talents of Scouts & Venturers revealed over 24 hours. The game required Scouts and Venturers to collect clues through bases and interrogation of characters, including Mrs Peacock, Prof Plum, Mr Green, Col Mustard, Ms Scarlet and Mrs White. The Dining Room required Scouts to feed one another over a 3 meter distance, as well as Waiting on Leaders to ensure they werenâ€™t dehydrated over the weekend. The Kitchen saw Private Investigators translating recipes which had been translated from German, to Japanese and then English again, through to grinding their own wheat to create a meal. Pots, Pans & Knives were thrown to relieve the stress from what seemed to be unsolvable puzzles. A few Detectives & Private Investigators found the Lounge quite appealing, possibly due to the ability to sit back and relax with a few classic games such as marbles and knucklebones. Alternatively, patrols could attempt to translate some ye olde English yarns, which only ended well after realizing they may be related to WWG North 2013 â€“ A Squireâ€™s Tale. A manor canâ€™t exist without a Conservatory nor Ballroom. From avoiding swinging stingers in the conservatory to attempting to perform various dance steps. Leaders running this base were always left entertained, and to our knowledge, didnâ€™t become insane from attempted dancing! The SC&T Rovers would once again like to extend a heartfelt thank you to all the Venturers and Rovers who attended the weekend.